It’s likely many have never heard the expression or phrase the “Internet of Things.” But it’s an integral part of your life today whether you realize it or not. And where it’s headed is a bit scary. 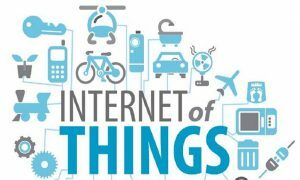 The concept is quite simple—the Internet of Things, or IoT, refers to the use of sensors to both gather data and take action across a network that connects trillions of data. This unbelievably large network enables information insights that have never been available before. The upshot to this is that the physical world is becoming one big information system. Like the proverbial frog that adjusts to the rising water temperature until it’s too late, the Internet of Things began with humans simply using modern-day advances to make our lives more convenient while sensing absolutely no threat or danger. For example, rather than adding wood to the fireplace when we get cold, we have a home thermostat that senses more heat is needed, automatically turning on the furnace, which raises the temperature. Other examples are when you have a motion detector automatically turn on a light at night in order for you to see. Or when your fridge beeps when you leave the door open. Or your phone is dead and your calls go to voicemail. The examples are endless. Those simple, useful ideas are of no concern to us while working independently. But what IoT does is that it connects all these seemingly insignificant cause and effect “THINGS” into a network—like your computer or phone connected to the “INTERNET.” These all connected now give you the Internet of Things, or IoT. Not sensing any danger, we humans are still in the water adjusting to the temperature. We reason we’re not Amish so creature comforts are making our lives easier. But to see where all this is leading, let’s look at a few more examples of IoT. Your stock portfolio senses a bad stock dropping in value, so automatically the bad investment is sold to protect your money. You pay for an airline ticket online with a credit or debit card and electronically it’s automatically subtracted out of your bank account. You eat dinner at your favorite restaurant adding a generous tip, paying with your credit card and it automatically is debited from your bank account. Again, these three examples don’t make us sense any danger. We just see the efficiency and conveniences provided. However, because all of these formerly independent things are being connected by the Internet, and the data gathered in the process, although unnoticed, will eventually boil us to death. No doubt you’re rolling your eyes at that last statement. Granted the IoT has made our hospitals more efficient, our traffic lights more organized and our businesses more profitable. But let’s take this information network up a notch. For instance, who’s watching all this? And does it matter? Just a few years ago it was revealed that Christian and conservative organizations were being targeted by the IRS. They literally harassed them for being conservative or Christian. And more recently, it has been revealed that it wasn’t too hard for the Democrat government in power to spy on the opposing Republican Party’s election strategies. When you also consider the NECESSITY of the Internet for everyday use, it adds even more importance the IoT equation. Twenty years ago, at certain times of the year, this ministry routinely paid phone bills of over $2,000 a month. But now, thanks to the Internet, we pay around $350 for the same service. For us, the Internet has become a necessity. The need to have our compass.org website, and even sending out this article via email, makes using the Internet critical for us. But are we inching toward a cliff without realizing it? Are we allowing a noose to encircle us? Will we humans eventually boil to death? Yes, we will. Ultimately, whoever controls the Internet, and the Internet of Things, controls all things. Today, without access to the Internet we pay more to make banking transactions, receive phone calls and just communicate in general. When the wrong entity from the dark side gets control of the Internet, it’s too late and the water begins to boil. And all of this was prophesied in the Bible 1900+ years ago. Today we can easily see how one person can literally control all the monetary transactions on earth. But all in God’s timing. The Bible tells us that it’s the Lord Who allows leaders to rise and fall. God is in full control of this earth and its leaders. Zuckerberg denied he was doing anything wrong. But the cat was now out of the bag. FB DOES monetize their data, which is our data. But Zuckerberg said he was just doing what your local pizza delivery company does when it keeps up with what you ordered, when you ordered, how you paid, where you live, etc. Most of us by now have noticed that if we Google an item online, like searching for a new BBQ grill, for days or weeks we’ll see advertisements show up for BBQ grills when we innocently use the Internet. The point is that our personal data is being gathered. Actions are being taken based on our everyday choices stored online. So there is a LOT of personal data being collected, more every second. 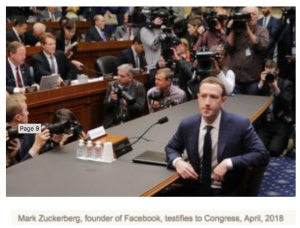 In Zuckerberg’s Congressional testimony it was revealed that Facebook has roughly 1500 pieces of information about every user. Even more interesting is that they have over 100 pieces of information on non-users! How is that even possible? The IoT is continually evolving as wireless Internet becomes more dominant and embedded sensors grow in sophistication. Where you go, what you eat, what you LIKE, what you read, how you travel… everything is being monitored, mined and used to influence and manipulate your life. In addition to tracking keystrokes on your computer, watches are now sensing data and reacting to commands. Not to mention Siri and Alexa constantly listen to literally every word uttered in a house in order to hear and react to commands. The IoT is exploding exponentially! And it’s difficult to not be monitored. It was just revealed that even if you turn off personal tracking on your computer, Google continues to track you through services like Google Maps, weather updates, and browser searches — any app activity can be used to track you. Much of the data harvested can be used for good. For instance, through the IoT police departments have found a whole new way to find the bad guys through the Internet’s social media. Credit card fraud is being severely reduced by notifying you when someone out of state or in a foreign country is using your card number. But needless to say, this data can also be abused. It was the Lord who allowed Barack Hussein Obama to be President for His own purposes. It was the Lord who allowed Donald Trump to win for His own purposes. God is in control of every nation on the earth, all the time, even when He’s been quiet for a few thousand years. And one day, post-Rapture, He will no longer be quiet but will reveal Himself to the world. 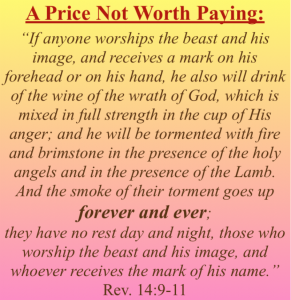 It’s at this time that God will allow the entire world to be controlled by one man, who is eventually embodied by Satan. He will use the Internet, the Internet of Things, or a close cousin to exert total and forceful control. Thankfully by the Grace of God, Believers are exempted from enduring the horrific conditions surrounding this future time. God promises we’ll be taken up and above the Tribulation, “just like” Noah was taken up and above the floodwaters (Matt. 24:37). Jesus is our rescuer. And just like Noah returned to the earth, Believers will also return to the earth with Jesus after the 7-years of Tribulation, to live and reign in the 1000-year Millennium. Should Christians Be Concerned About IoT? So yes, where IoT will eventually take the world is scary, but using the Internet for convenience in the Church Age is not sin.